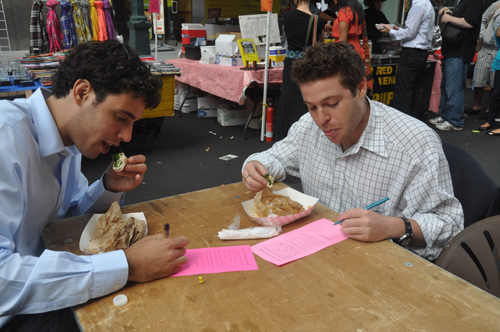 The initiators collaborated with the Street Vendor Project (SVP) of the Urban Justice Center to campaign against New York City Council Member Jessica Lappin’s 2010 law project. The bill, intended to revoke permits issued to street vendor trucks if they got parking tickets, was so restrictive that it threatened to put most food trucks out of business. As a way of protest, REV and SVP designed and handed 500 pink mock “citizens’ parking tickets” to Lappin during the hearing, signed by vendors and 500 members of the general public. To create a campaign drawing attention to this attempt to legislatively criminalize the City's food vendors. By garnering negative publicity in media such as The Wall Street Journal, The New York Times, and local foodie blogs, Lappin's bill was defeated before it got to the hearing.